VedicMaths.Org - 67 - When is Mathematics Vedic Mathematics? 67 - When is Mathematics Vedic Mathematics? A warm welcome to our new subscribers. Vedic Mathematics is becoming increasingly popular as more and more people are introduced to the beautifully unified and easy Vedic methods. The purpose of this Newsletter is to provide information about developments in education and research and books, articles, courses, talks etc., and also to bring together those working with Vedic Mathematics. If you are working with Vedic Mathematics - teaching it or doing research - please contact us and let us include you and some description of your work in the Newsletter. Perhaps you would like to submit an article for inclusion in a later issue or tell us about a course or talk you will be giving or have given. If you are learning Vedic Maths, let us know how you are getting on and what you think of this system. This issue's article is by Kenneth Williams, editor of this newsletter. WHEN IS MATHEMATICS VEDIC MATHEMATICS? The last 10 years have seen a huge increase in interest in Vedic Mathematics. The system reconstructed by Sri Bharati Krsna Tirthaji almost a century ago (and now known by the term "Vedic Mathematics") is at last being recognised as having tremendous potential in all sorts of areas: educational, computational, scientific, psychological and so on. This new decade is sure to see this continue, and develop and expand further. The influential and unbiased article by Dr N. M. Kansara1 in 2000 dealt with the criticisms aimed at Bharati Krsna's use of the term Vedic Mathematics. But though there is much positivity and much to look forward to there is one important area that needs to be clarified, and that is the answer to the question: "What is Vedic Mathematics: what is included within this term and what is not?" Different people may have different ideas about the answer to this question. And it is not enough to simply refer to the book by Bharati Krsna as new material is being produced and termed Vedic Mathematics all the time. How do we decide if a particular piece of mathematics is Vedic Mathematics or not? What is the defining characteristic, or characteristics, of Vedic Mathematics by which we can recognise something as part of the Vedic system? Why is this question important? It is vital that this question is answered because there has to be some clear boundary to what is Vedic Mathematics and what is not. Otherwise people can declare all sorts of obscure mathematical results and claim them to be Vedic Mathematics. Another reason why the question is important is that for many people Vedic Mathematics has become synonymous with tricks, short cuts and fast methods. This is unfortunate as it means it is not seen seriously by mathematicians and educationists, and it entirely misses the comprehensive and complete nature of the system of Vedic Mathematics. Here are some possible answers to the question: what characteristic of a method, proof etc. makes it Vedic? Answer 1 I must reject as I believe the Sutras describe natural ways in which the mind works 2, so any way of thinking or any method must use the Sutras. Even the current long multiplication method (that cannot be described as Vedic) uses these Sutras. Answer 2 does not allow the possibility of methods being Vedic that are not given by Bharati Krsna and so is too restrictive. (For One-line Answers to all Mathematical problems)"
This is the full title: first Vedic Mathematics, then an alternative title, and then the words in brackets. This title implies that the Sutras are the basis for Vedic Mathematics, and that they give one-line answers to all mathematical problems. This is perhaps the criterion we are looking for: a method must be one-line. But this answer is no use to us unless we can say what 'one-line' means. In the area of computation we can say 'one-line' means that the answer can be given digit by digit with an occasional carry digit (or digits), which can be held in the mind. The term also suggests that the flow of attention is one-line: that the attention is not fragmented. A good illustration is perhaps the obtaining of the product of two numbers by the Vertically and Crosswise method and by the usual conventional method. In the Vedic method the attention moves through the numbers being combined, obtaining the digits of the answer one after the other (from right to left or from left to right) using a simple pattern. The conventional method is fragmented, obtaining first one row of figures and then another until finally these rows are added up. In fact the same number of products are found in both methods, but the Vedic method flows, and flows in one direction: i.e. it is one-line. "…by means of what we have been describing as straight, single-line, mental arithmetic", suggesting that 'one-line' is equivalent to 'mental'. I therefore propose that the main criterion for a method to be Vedic is that it has this one-line feature. But a technique should not be rejected outright on the basis that it is not one-line. If it is better than the conventional method, it is worthy of consideration with a view to further development. The above illustration of multiplication happens to be a convenient one. Mathematics is not just about computation though, but about proof, problem solving, structure and so on. So how does the one-line flow of attention criterion apply more generally? It is hoped that this article will generate some response to these questions in those interested, and if so you are requested to email with your views. 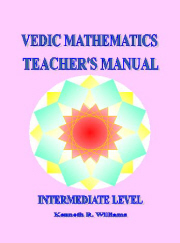 Without a clear idea of the boundaries of Vedic Maths the subject may gradually disappear, with only certain techniques which are popular remaining but not being known to be part of a complete system of Vedic Mathematics. My thanks are due to Andrew Nicholas for his helpful comments during the formulation of this article. 1 "Vedic Sources of 'Vedic Mathematics", Sambodhi, Vol. XXIII, 2000. Many thanks to Kevin Carmody for making it possible to include the Sanskrit, fractions etc. of this text on the website. Summary:Vedic mathematics is the name given to the ancient Indian system of mathematics that was rediscovered in the early twentieth century from ancient Indian sculptures (Vedas). It mainly deals with Vedic mathematical formulae and their application to various branches of mathematics. The algorithms based on conventional mathematics can be simplified and even optimized by the use of Vedic Sutras. These methods and ideas can be directly applied to trigonometry, plain and spherical geometry, conics, calculus (both differential and integral), and applied mathematics of various kinds. In this paper new multiplier and square architecture is proposed based on algorithm of ancient Indian Vedic Mathematics, for low power and high speed applications. It is based on generating all partial products and their sums in one step. The design implementation on ALTERA Cyclone -II FPGA shows that the proposed Vedic multiplier and square are faster than array multiplier and Booth multiplier. You are invited you to join the group. 9 is a unique and amazing number with which one can solve problems in interesting way. Answer will be of three parts. First part: Subtract 1 from first digit of the multiplicand. Second part: Here the multiplicand is 3 digits. So, put two 8's. Third part: Complement of the last digit of the multiplicand. Anusuya Kandanathan I has been teaching Vedic Mathematics to hundreds of children in Dubai at Knowledge Square Children Development Centre for the past 5 years. Contact number is 00971 50 6988143. * Love the information available on your web site. I am new to Vedic but have been trying some of the methods with my students and they have started to create a real buzz around school. Maths Consultant, Manchester Enterprise Academy. * I am enjoying the Division section on Disc 2. The set is very good teaching. I can see why from the brief time I have been exposed to this method that it is called the gem of vedic math. I wish had been instructed in vedic math when I was 13. It would have made me love math rather than develop an aversion to it. * I love it when people think outside the box for answers. I think that is one of the reasons I like vedic math. It teaches you another and better way to understand math problems. Please pass a copy of this Newsletter on to anyone you think may be interested.